AACE invites you to submit an abstract and have the unique opportunity to have your work reviewed by experts in the field of endocrinology. Each year, the AACE Annual Scientific & Clinical Congress draws hundreds of abstracts submitted by endocrinologists and other health care professionals from around the world. If accepted, your abstract will be published as an online supplement to AACE’s medical journal, Endocrine Practice. This is your complete guide for submitting an abstract to AACE 2019. Please take a moment to read this entire guide prior to submission to become familiar with the guidelines and rules that apply to abstracts. Accepted abstracts are made available to the public online on Thursday, April 25, 2019, and will be published as an online supplement to Endocrine Practice. The information contained in those abstracts may not be released until the date of poster presentations. Academic institutions, private organizations, and information contained in an abstract may issue a press release to coincide with the availability of an AACE abstract on the AACE website. 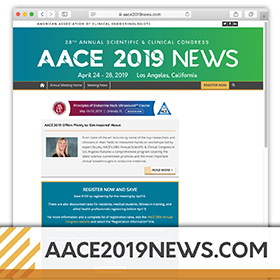 However, AACE continues to require that information that goes beyond that contained in the abstract (e.g., discussion of the abstract done as part of a scientific presentation or presentation of additional new information that will be available at the time of the meeting) is under embargo until 9:45 am ET on Thursday, April 25, 2019. Violation of this policy may result in the abstract being withdrawn from the meeting and other measures deemed appropriate. Authors are responsible for notifying financial and other sponsors about this policy. You will not be able to access your submission after 11:59 pm Eastern Time on Monday, December 3, 2018. WHAT IS ELIGIBLE FOR SUBMISSION? WHAT IS NOT ELIGIBLE FOR SUBMISSION? The abstract limit is 2,700 characters, including spaces. Count excludes the title, names of authors/coauthors, authors’ affiliations and disclosures. Abstracts marked “incomplete” at the close of the submission deadline will be ineligible for consideration. Do not use new technical words, laboratory slang, words not defined in dictionaries, abbreviations, or terminology not consistent with internationally accepted guidelines. Define any abbreviations the first time they are used. Omit all names and geographical references in the body of the abstract. Use standard abbreviations. Place special or unusual abbreviations in parentheses after the first time the full word appears. Do not abbreviate compounds in the title of the abstract. Use numerals to indicate numbers, except when beginning sentences. AACE will only publish commonly used acronyms included in the unified list of acronyms approved by the principal journal editors in the field of endocrinology. Please refrain from using all trial group acronyms in abstract titles. Acronyms may remain in the body of the abstract and in the author list. Tables, images, and/or graphs SHOULD NOT be submitted online. They may be included in the poster session. AACE does not charge a processing fee for abstract submissions. During submission, the author will be requested to agree to a copyright transfer if the abstract is accepted. The submitting author will agree to the terms of the copyright transfer on behalf of all coauthors. The Agreement transfers to AACE the copyright and all other rights of the material comprising the abstract upon acceptance. The American Association of Clinical Endocrinologists, as the holder of the copyright on the accepted abstract, reserves all right of reproduction, distribution, performance, display, and the right to create derivative works in both print and digital formats. No patient rights are assigned. Abstracts will be reviewed by the AACE Abstract Review Subcommittee and scored numerically 1 through 10 based on merit and significance to the science and practice of Endocrinology, as well as their creativity and uniqueness. After the submission deadline, completed abstracts will be reviewed. “Incomplete” abstracts are considered incomplete and will not be reviewed. To ensure the integrity of the review process, revisions to abstracts will not be accepted after the submission deadline – no exceptions. All abstracts will be reviewed without knowledge of the author(s), institution(s) or disclosure information. Accepted abstracts will be selected for publication only, poster presentation, or oral presentation. Top scoring abstracts will be eligible for awards, and the most outstanding abstracts among them will be considered for oral presentation. A complete list of awards will be available on the AACE Annual Meeting website. Original research and clinical trials will receive higher consideration for awards. AACE members who are the primary author will be considered for travel grants. * To qualify for the Domestic Travel Grants, the Fellow-in-Training or Resident must be an AACE Member enrolled in a fellowship program or residency within the United States. AACE will notify the primary author of the status of their abstract in early February. It is the primary author’s responsibility to then notify all co-authors. AACE requests that all interested parties please refrain from directly contacting the AACE offices to obtain information regarding abstract status, notification distribution and/or publication dates. Please check the annual meeting website regularly the most up-to-date information https://www.aace.com/. The submitting/primary author is the only author who will receive notification from AACE. The poster display schedule, specifications and onsite presentation details will be finalized soon. A very limited number of abstracts may be selected for an Oral Presentation Session. Specific details regarding oral presentations will be sent to the primary authors of the selected abstract. The annual meeting is a private event. Programs presented at the meeting are for the education of attendees and purchasers of recorded presentations as authorized by the American Association of Clinical Endocrinologists. The information and materials displayed and presented during this meeting are the property of AACE and the presenter and cannot be photographed, copied, photocopied, transformed to electronic format, reproduced, or distributed without written permission of the American Association of Clinical Endocrinologists and the presenter. Any use of the program content for commercial purposes, which includes, but is not limited to oral presentations, audiovisual materials used by speakers, and program handouts without the written consent of AACE is prohibited. This policy applies before, during and after the meeting. AACE will enforce its intellectual property rights and penalize those who infringe upon it. The names, insignias, logos, and acronyms of AACE are proprietary marks. Use of the names in any fashion, by any entity, for any purpose, is prohibited without the express written permission of the American Association of Clinical Endocrinologists. Attendees who have questions about AACE’s copyright policy should contact the public relations department at pmr@aace.com. Credentialed media attend the annual meeting to cover stories for consumer, trade and other media outlets, and are easily identified by their press ribbons. Media has access to all general sessions and limited access (at the discretion of speakers) to Meet the Professor and Workshop sessions. Media may use hand-held audio recorders and still cameras; moving video recording is also permitted with the permission of the presenter(s). The exception to this policy is that no photos or video are allowed in the Exhibit Hall. Press who would like general photos of the Exhibit Hall can obtain these after the meeting from AACE. Attendees who have questions about AACE’s media policies should contact the public relations department at pmr@aace.com. As a courtesy to our presenters, AACE policy does not permit photographs or recordings during educational sessions, including poster sessions. The only exception to this without prior consent from the presenter is for registered media, who should review their registration for more information. All accepted abstracts will be available on the AACE Annual Meeting website on Thursday, April 25, 2019. They will be published as an online supplement to Endocrine Practice. Proofread abstracts carefully to avoid errors prior to submission. Your abstract, if selected, will be published exactly as submitted. You may return to the online submission site to revise your abstract until 11:59 pm Eastern Time on Monday, December 3, 2018. After this date/time, the submission site will close and no additional changes, edits, revisions, etc. can be made. Should a submission contain errors or the omission of contributing author names after the deadline, presenters may opt to have the abstract withdrawn. Withdrawing Abstract: Primary authors may withdraw a completed abstract before December 3, 2018, by clicking on “Complete” in the Abstract Status line. You will be directed to a page that will allow you to select “Withdrawn” from a drop-down list of Abstract Status options. Please be sure to click on Update Abstract before leaving this page if you choose to withdraw your submission. After December 3, 2018, presenting authors may submit a request to have an abstract withdrawn. All requests can only be made by the presenting author and must be submitted via e-mail to abstracts@aace.com. ** The removal of the abstract from printed materials cannot be guaranteed if the request is received after February 25, 2019. The late-breaking abstract category allows for the submission of truly late-breaking scientific research for which no preliminary data are available at the time of the Monday, December 3, 2018, abstract submission deadline. Late-breaking abstracts should present data that is groundbreaking, innovative and has a high impact factor. This category is not a mechanism to allow for updated data to be submitted later when preliminary data are available by the general abstract submission deadline. The late-breaking abstract submission site will open on Friday, January 25, 2019, and close on Wednesday, March 6, 2019, at 11:59 pm Eastern Time. Submitters will not have access to the submission site after the submission deadline. Please check the annual meeting website for submission site link. Late-breaking Abstracts will be published online before the annual meeting. Visit the annual meeting website in February for our official late-breaking abstracts launch announcement. All presenting authors are required to register and pay the appropriate registration fees and arrange hotel accommodations. Submitting an abstract or acceptance of an abstract does not register you for the meeting or ensure hotel accommodations for the meeting. Registration and housing will open in Novemeber 2018.